How do you make a car stronger yet lighter? Easy, you take it to bits and study every piece, removing grams wherever possible. 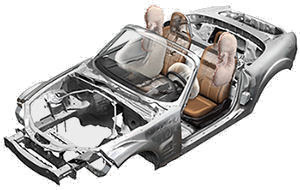 Sounds simple enough but to understand just how meticulous and borderline obsessive Mazda's weight reduction programme is, check out this short video. Shigeo Mizuno talks us through the thinking behind the idea and the work the company's engineers did with the Mazda 2. Impressive stuff I'm sure you'll agree, especially the use of high strength steel to make up for cutting holes out of the body wherever they could. Of course, once the body weighs less you can then reduce the size of the brakes required and smaller suspension springs in a kind of virtuous circle. This also helps improve fuel efficiency as you get where you're going without taking extra kilos of dead weight with you. See my post Naked Roadster for more on that. In the clip below from the BBC, Top Gear's Richard Hammond makes the point about how the NC weighs just over 9kg more than the previous generation. This is despite being a larger car with more equipment than ever before. And as for that perfect balance and 50:50 weight distribution, well see for yourself in the clip below. Mazda USA built a giant see-saw and parked a Roadster on top, pretty impressive engineering! This exceptional balance was partly achieved through borrowing the RX-8's front-midship design. The Roadster's engine sits further back from the front axle than your average car. Now you can argue all day about whether this makes the car's layout FR, or MR, but probably the easiest way is to describe it as FMR. That is to say, Front-Mid engine Rear wheel drive. So the next time someone laughs and tells you your Roadster got fat and isn't a real MX-5 anymore, you can politely point out that this isn't the case at all. But what of the retractable hardtop (RHT) model? Well of course it is heavier given the motors required (there are 4 of them) and the additional mechanism for the folding roof. 37kg heavier than the equivalent soft top to be exact. The power roof is 20mm thick and made from a fibre/plastic composite on the outside and a glass fibre reinforced polypropylene for the inside. You'll notice the inside has a dimpled surface that didn't need painting or even a roof liner as that would have been additional weight. You can read more on Gram Strategy here and also here.